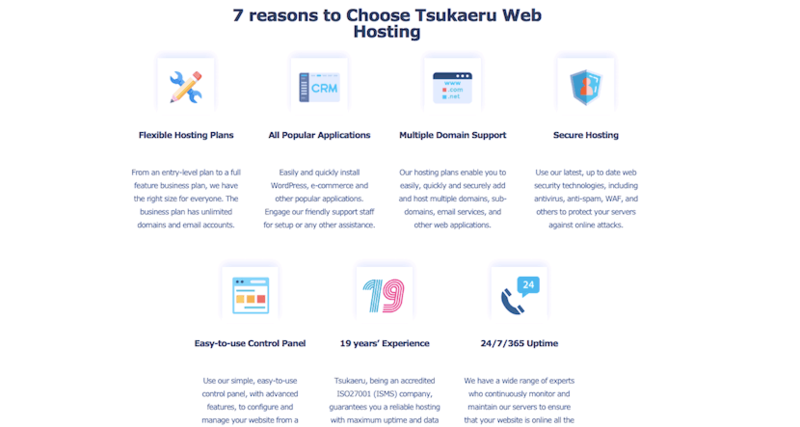 Tsukaeru Review 2019: Is Tsukaeru a Good Hosting? Tsukaeru offers a wide range of website hosting services. Customers enjoy 24/7 customer service, as well as some advanced level features. Tsukaeru is located in Tokyo, Japan. They’re a long standing company that has been in business since 2002. Their aim is to provide “cheaper and more sophisticated” services than other companies. The website is available in Japanese and English. 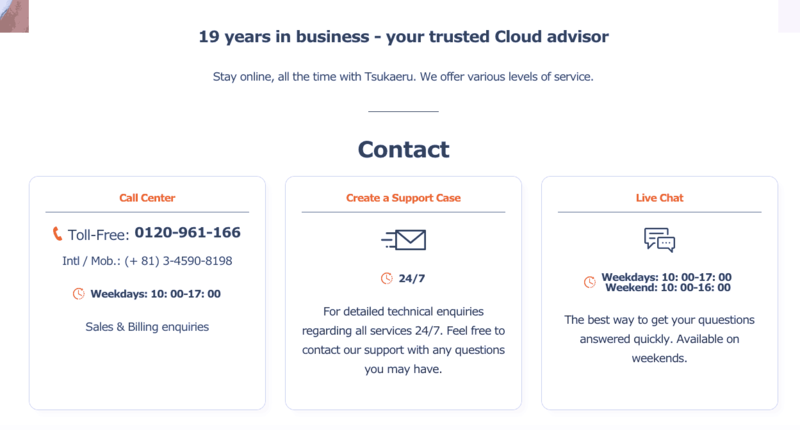 Tsukaeru offers a wide range of hosting services including shared hosting, dedicated servers, managed servers, and cloud virtual private servers, as well as domain registration and SSL certificates. They have a global infrastructure with servers located in Japan (their main center) and the U.S. and dedicated fiber networks in Japan, U.S. , Australia, Singapore, and Indonesia. They boast 100% uptime, use a fully redundant network with multiple layers of security layers, and a redundant power supply. Tsukaeru offers four levels of shared hosting plans: Beginner, Personal, Business-Pro Lite, and Business Pro. They all use solid state disk drive storage (for disk read/write times up to ten times faster than traditional hard disk drives) and come with 10GB, 20GB, 100GB, and 200GB respectively. All of the plans come with unlimited domains, excluding the beginner plan (which comes with five), as well as a dedicated IP address. Be sure to check the features inclusions for each plan, as many of the features are only available in the highest priced plans. All plans come with support for PHP versions 5.5, 7.1, and 7.2, SNI, SSL support, control panel access, and a one-click installer, while SSH access, Cron Jobs, and backups (website and PC) are only available in the two highest price plans, and MySQL databases and mobile backups are available in the three highest packages. Oddly, Waffle firewall is only available in the highest priced plan. There is quite a large price difference between the Beginner package and the Business Pro package, however, there’s quite a large difference in the features as well. If you’re a new or beginner website owner and you don’t require some of the more advanced features (MySQL databases, cron jobs, SSH access), the Beginner plan could be an affordable option for you. However, be prepared to pay a premium for the advanced features in the higher plans. Plans can be purchased in one, twelve, twenty-four, and thirty-six month increments. There’s also a ten-day free trial on all plans. A little gripe of mine is that backups are an added cost in most of the plans and the cost is as much, if not more, than one month of hosting. It’s quite a substantial add-on to consider. Domains are only free in the two highest price plans, while SSL support comes with all plans. So, the pricing is a little strict, but the good news is, their support provision is solid with 24/7 technical support via ticket. There are some terms and conditions related to contacting them out of hours but, nevertheless, they do have an emergency contact available at any time of the day. They also have telephone and live chat support from 10:00 a.m. to 5:00 p.m. on weekdays and live chat support on weekends from 10:00 a.m. to 4:00 p.m. For customers who want to solve their problems on their own without contacting support, they have a large knowledge base with over 700 Japanese documents and 100 English documents. Tsukaeru are a hosting company with a long track record. They are ISO27001 certified, have won awards for their service, and have positive customer reviews. Wondering how Tsukaeru stacks up against other Web Hosting companies? Enter any other Web Hosting company and we will give you a side-by-side comparison.